Afrobeat was specially created by the legendary Fela Anikulapo, originally known as Fela Ransome-Kuti, a radical artiste who fought against injustice and executive recklessness through his addictive brand of music. His sons, Femi and Seun have been able to sustain the popularity of the genre and President Macron will certain have fun at the African Shrine. President Macron’s itinerary is packed on July 4, 2018, as he starts the day opening the magnificent Alliance Francais building at 9am. The new-look Alliance Francaise Lagos facility is a beautiful sight to behold. The Alliance Francaise which is located in Ikoyi, Lagos is the biggest and best such facility that blends today’s innovative and classy design with the traditions of the past, according to impeccable sources. This scenic upgraded Chateau-style Alliance Francaise means more Nigerians can learn about French culture and language in Lagos, the commercial capital. This is a welcome development which is bound to promote greater interaction between Nigeria and France and expand business opportunities, cultural exchange and employment. The Alliance Francaise Fondation is the premier cultural organisation in the world, founded on 21 July 1883, it now has 800 local associations in about 133 countries. It is supported by grants from the French Government and the generosity of patrons, including its founding fathers who are notable Frenchmen like the scientist, Louis Pasteur, the publisher, Armand Colin and writers, Jules Verne and Ernest Renan. The renovated building, which is a villa now has new additions which have transformed it almost completely. There are spectacular alterations done to the amphitheatre and the internal auditorium to give it a touch of timeless elegance. The Lagos accommodation has been improved, increased and enhanced, and sure to provide guests with an unforgettable experience. And there is superb space for the library and administrative offices. Quite simply, the modernisation that has gone into the building is simply breath-taking and only befitting of an organisation with the size and stature of Alliance Francaise Foundation. President Macron is expected to address the Tony Elumelu young entrepreneurs event at Eko Hotels & Suites at 11am. The event would be followed by a networking reception at the invitation of the Chairman of Chagoury Group, Mr Ronald Chagoury. Playing co-host to President Macron as he visits Nigeria will be the French Ambassador to Nigeria, His Excellency Denys Gauer. Ambassador Gauer is a seasoned International diplomat who has served in various capacities both domestically and internationally on behalf of the French Foreign Ministry. He is an adept and able diplomat whose views are well respected and cherished. He has done a lot for Franco-Nigerian relations since arriving Nigeria as the French Ambassador which has led to increased business and cultural relationships between French and Nigerian citizens. Indeed, it is this sort of interaction that has facilitated the spectacular facelift that Alliance Francaise Lagos now enjoys. Since being elected, President Macron has stamped his unique authority and style not just on French life, but also on the European Union, international politics, business, anti-terrorism, climate change, culture, religion and the general well-being of humanity. His stance on various issues including nuclear proliferation, terrorism and the unity of Europe has won him many admirers and increased the stature of France in the comity of Nations. President Macron’s visit is therefore coming at a more opportune time. Nigeria is preparing for its own democratic litmus test , and it is a homecoming of sorts because of his short stint in Nigeria where he lived and made friends. It is also symbolic that his visit coincides with the beautiful renovation and refurbishment of the new Alliance Francaise building in Lagos. This is because of President Macron’s avowed belief that cultural interaction can only benefit the improvement of progressive relations between countries. The story of President Macron is bound to inspire the youths of Africa. It is a fairy-tale. He was born on 21 December 1977 in the French village of Amiens. He had his primary education in the village and went on to complete his final year of High School in Paris. He obtained a degree in Philosophy from the University of Paris-Ouest Nanterres La Defense. Afterwards he expressed the beginning of a literary bent which was to impact positively on his political career by being an editorial assistant to a French Philosopher writing his memoirs and also becoming a member of the editorial board of the literary magazine ESPIRIT. Subsequently, he then went on to obtain a Master’s of Public Affairs from the Paris Institute of Political Studies, Sciences Po. Thereafter, he trained and graduated from the École Nationale d'Administration (ENA) in 2004 and during the course of that training worked at the French Embassy in Nigeria. Upon his graduation from ENA, he worked as a senior civil servant at the Inspectorate General of Finances. He resigned from the Civil Service in 2008 to become an investment banker at Rothschild & Cie Banque. President Macron was responsible for putting together several business deals at Rothschilds. He continued his affiliation and dalliance with the Press by becoming friends with a member of the supervisory board of Le Monde. Thereafter he assisted with the recapitalisation of Le Monde and was promoted to Partner level at the bank in 2010. Also in 2010, he was appointed managing director of the Bank and put in charge of Nestle’s acquisition of a subsidiary of Pfizer. He became an instant millionaire as a result of the huge success of this Nestle transaction. The money and contacts he made as an investment banker and friend of the press were to stand him in good stead during his successful 2017 Presidential bid. His political career is the stuff of dreams for aspiring young politicians. He joined the Socialist Party of France when he was 24, but was an effective member only after 2006. In 2007, he attempted to run for office in the National Assembly on the platform of the Socialist Party, but his application was declined. He joined the staff of President Francois Hollande in 2010, but declined to be Chief of Staff to Prime Minister, Francois Fillon, that year. In 2012, he was made a Deputy Secretary-General on President Hollande’s Staff. Macron resigned from the government in June 2014 to continue his personal aspirations and was employed as Research Fellow at the University of Berlin with the help of his rich businessman friend. Alain Minc. In this period he declined to be a candidate for municipal elections in his hometown of Amiens. Providence was soon to smile on him as he was appointed Minister of Economy and Finance in the government of Prime Minister, Manuel Valls. He was the youngest Minister of the Economy since 1962. As a Minister he pushed through several significant business reforms including his signature law package known as Macron 1. Macron left the Socialist Party in August 2015 and launched his own party, En Marche, in his hometown in April 2016. It was soon clear that he was a popular candidate who engaged and resonated with all sectors of the French populace. He resigned from the government in August 2016 to launch his campaign to be President in the 2017 Presidential election. In November 2016, Macron declared that he would run as the candidate of En Marche! Macron was heavily supported by the media and business. He won 24% of the votes in the first round of the Presidential elections on 23 April 2017 and, as this was the most votes, went into a run-off election with Marine Le Pen of the National Front. 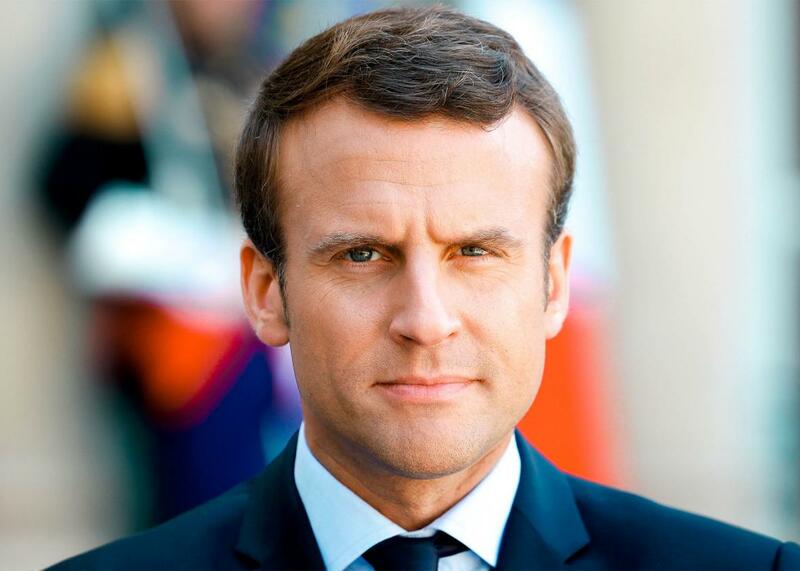 He won this second round of Presidential elections on 7 May 2017 by a landslide victory of more than 66%, thus becoming the youngest ever French President. In June 2017, En Marche and its political partner, the Democratic Movement won a comfortable majority in the National Assembly, winning 350 seats out of 577. Indeed, En Marche itself won an outright majority of 308 seats.